Fixy Network [FXY] is a Blockchain-based OTC exchange&marketplace solution. Use cryptocurrency to buy goods&assets through user-friendly apps. Fixy Network makes it possible for people to use cryptocurrency in their day to day life. The Network will include a decentralized marketplace and a decentralized Exchange. Getting into cryptocurrency market has never been an easy process of a new cryptocurrency enthusiast, but with Fixy Gift Card, which is going to be available in every corner store and going to be sold in FIAT. 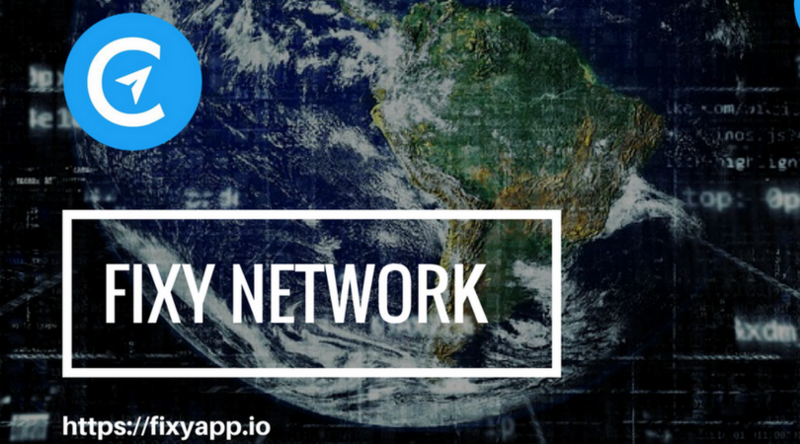 The whole Fixy network is designed to facilitate easy entry into the world of cryptocurrency and also has features that will allow efficient application of cryptocurrency to daily life. Gift Cards provided by Fixy will give an opportunity to people to get into the cryptocurrency-world without going through any unnecessary verification process which takes longer than it should. Purchase of the Gift Card is going to be provided by the Stores which are verified by Fixy and are going to be easy to find using our Store Locator. Gift Cards will be sold by FIAT money, which will be possible to deposit on the Fixy App where a user can use this amount in decentralized Exchange and decentralized Marketplace. The Fixy OTC trading feature is completely decentralized. The OTC trading feature of Fixy will let users exchange their Cryptocurrencies both in cryptocurrency and FIAT money without any fees charged by Fixy. To become part of the cryptocurrency world, people need to invest in a coin with a FIAT value, but the exchange platforms which provide these services have fees which make these transactions more expensive than they should ordinarily. 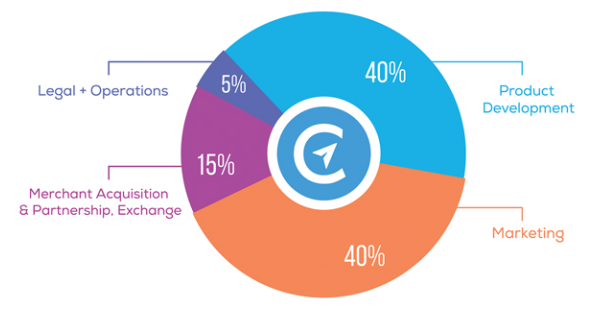 However, with the decentralized OTC Trading, Fixy will provide a shortcut to investment in cryptocurrency. Exchanges are continually under cyber-attack which creates a huge risk for the investors. Moreover, withdrawing your investment from an exchange takes a long time. Apart from the risk of cyber-attacks and the long wait involved when it comes to withdrawing from exchanges, users are sometimes unable to access their account because of a maintenance which means they will not be able to sell their investment on time. On the other hand, OTC Trading investors keep their own wallets which are less likely to get hacked compare to an exchange. The “Store Finder” feature is going to let users check their surroundings to find a Fixy accepted store where a user can buy goods using Fixy. Also, this feature will facilitate cryptocurrency trading, as users will be able to use it to find their favorite cryptocurrency and other traders who want to sell or buy. 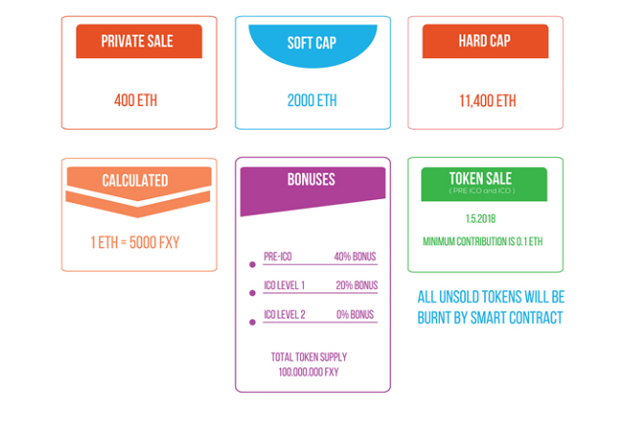 The fixy network also utilizes smart contracts for making deals, in this case, the fixy token will be used for payment. On the other hand, users can conduct OTC trades without a smart contract by using our free and secure messaging service. This second feature will have a trust score system where users can leave reviews and ratings on the nature of their experience while trading with another user. The Fixy Network brings together customers and retailers who are interested in participating in using cryptocurrency for transactions. New participants can get into the world of cryptocurrency by purchasing the Fixy gift card which would be sold in approved stores across the globe. New users' card will be credited as soon as they have gone through the "know your customer" process which is very fast while existing users' balance will be loaded directly into their wallets. 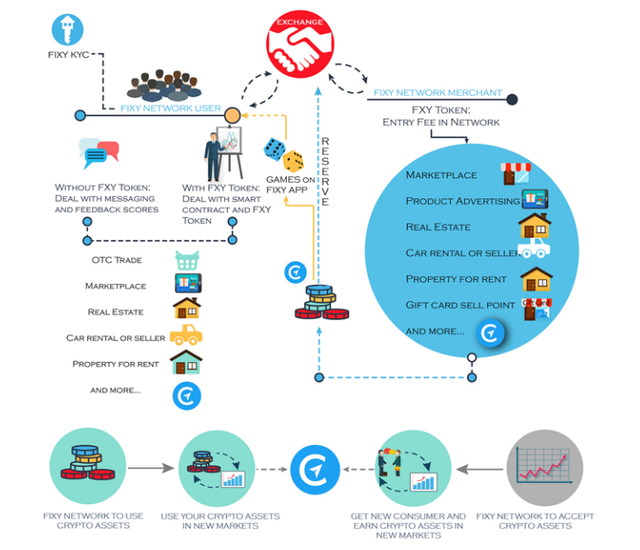 In other words, the general idea of the Fixy marketplace is to connect users and partners via a simple process. The Fixy app provides shortcuts for newbie cryptocurrency enthusiast to enter the world of cryptocurrency by making it easy and secure for investors to monetize their Cryptocurrencies. The Fixy app allows companies and ICOs to reach more customers, brands to sell more and get paid in both cryptocurrency and fiat. The Fixy app has a decentralized peer to peer marketplace and a decentralized OTC exchange. Fixy will offer a gift card which will be available in every Fixy network store and will be sold in fiat. Users will be able to access feature like OTC trading for cryptocurrency, gold, and silver within the app. The store locator on the Fixy app will also make it easy for users to find the nearest Fixy store to them. Hey. I signed up for your blog. I'm a developer of bots! If you need to promote something in automatic mode or a poster, you can write to me in the @coinshelper telegram. I also sell programs for telegrams. User parser and the inviter in groups. Subscribe to me @bot.creator! I signed and licked you!